At the Festhalle I have seen my first Mac's concert! Wow, I still can't believe that. I have just returned from Germany to Italy and still can't believe it (maybe because I didn't sleep tonight...). No, really, they were fabulous! Lindsey almost got angry with his guitar and Mick was at his best on the drums. John McVie was very apart, many beautiful moments from his bass guitar too. And then there's Stevie, her voice and her charm. Many shawls and the fringes up the microphone and then the most beautiful present she could have done to us: Beautiful Child... She also said that that song meant much to her... Oh, I still don't realize what happened completely. But I was happy, very very happy! it was a incredible night,I hoped the Mac tour in Italy so also my wife can be in this wonderfull experience,NEVER BREAK THE CHAIN..... thanks really. 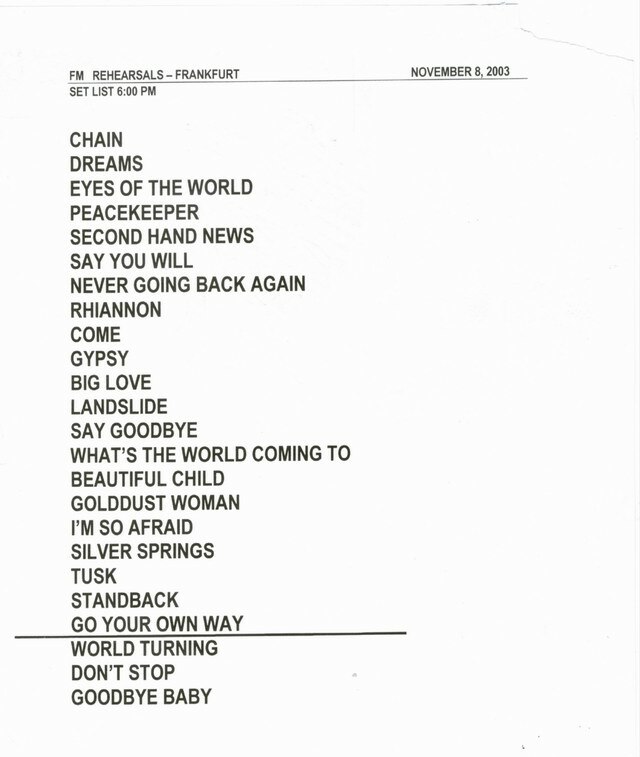 My first Fleetwood Mac concert was 09-07-1990 in Essen Germany during the “Behind The Mask Tour”. But that Tour was without Lindsey. Since I had saw him on the “The Dance” DVD….I know I must see him live! But real reason why I become a Fleetwood Mac fan is that wonderful women called Stevie Nicks who came like the rest of the band a little bit to late on stage last Sunday 11-09-2003 to start like ever before with “The Chain”. I was very curious how she will look like. And although she looks very tired….she was absolute GREAT and beautiful. I hope I will have a little bit of that beauty when I’m in the age of 55. I was standing in the second row. So I was maybe only two meters far from her. I was very impresses of her voice. Yes her voice has changed some deeper, but she sounds gorgeous!!! I was very happy that they don’t have some of that big stage shows and effects like other bands. So you can only concentrate on Stevie and Lindsey during they perform their songs. I never heard “Second Hand News” live before….but it seemed that Stevie enjoyed that song. Because during the chorus she played wild with the strings on her micro. And it was funny to watch that. I was a little bit disappointed that Stevie only once or two times search an eye-contact with their fans. Lindsey on the other hand was always in the near of the audience. It was possible to shake hands with him and you could play or touch his guitar. When he played his solos…he was in another world. He stand there with closed eyes and it was fantastic to see how this “god of guitars” is playing! But it was also overwhelming to see with how much devotion Stevie performed her songs. During Landslide when only Lindsey is playing the guitar you can enjoy that wonderful powerful voice . And the feelings she brought into her songs were amazing! Also the beautiful smile at the end of “Silver Springs”. It was like they were playing a “Greatest Hits Tour”. One great song after another. “I’m Afraid” with an perfect solo from Lindsey to Rhiannon. Wow – wow – wow! The songs I most was happy to hear were “Beautiful Child” which was for me the highlight of Stevie`s songs. She thanked the band that they give her that chance to perform that song live! She thought she would never do that. “Stand Back” there she rocked on like I never saw her before. Very funny was the “boxing” from Lindsey and Stevie during “Tusk”. Certainly it’s a show that they do all the 70 nights before….but it seems that they really have fun during the whole concert! Interesting was it to hear the part in “Don’t Stop” which normally Christine sings. It was different but I liked it by the way Stevie did it . Funny is it also to watch John. He only needs one meter on stage. Besides when Lindsey is knock him. Mick’s solo was also very amazing. “Goodbye Baby” is the perfect song (after Christine and her “Songbird” is gone) for a great end of a fantastic show which you never will forget. I saw many different concerts. But this was the highlight of my live! I enjoyed every second of that concert. And so I was very sad that the concert in Nürnberg where I also want to go was cancelled. But anyway. THANK YOU – FLEETWOOD MAC – for an unforgettable night! Thank you Lindsey for your Smile…which I never will forget! Thank you STEVIE! You are gorgeous! No one will ever have that presence like you on stage! You are the reason why I love music! It was my first ever Fleetwood Mac Concert and i was very curious about what to expect, because i had such high hopes after knowing the band for 28 years. The show started, i guess like every Fleetwood Mac concert, with "The Chain" bringing back memories of my youth when i first heard Fleetwood Mac at the age of 12. Lindsey did an incredible guitar performance, i would consider him one of the world´s best and innovative guitar players and the crowd went wild during his long and perfect solos playing "I´m Afraid" or "Come". I was very impressed when i heard Stevie Nicks singing "Landslide" or "Beautiful Child" and she wouldn´t have to mention that these two are special songs, because you could feel it in the way she performed. And yes, i was haunted by the sound of her voice when she sang "Silver Springs". You could feel the chemistry of the band playing together. And as she mentioned that this was the 71st show of the tour i thought, well they love to play these songs. And i was really lucky that i could make it to their first european show and i had an incredible view from the balcony, maybe 15 meters away from Stevie Nicks. I always thought that a rock show should incorporate dancing and big stage effects until i saw yesterday´s show and realized it´s the physical presence and singing performance that was most important. Stevie´s voice was present, sometimes overwhelming, because she has an incredible talent expressing feelings through this voice. The smile at the end of her performance of "Silver Springs" has more effect on people that every trendy stage show could have. It´s not about effects, it´s the songs that matter. When one has such a big repertoire of classics and also the possibility of performing such good new material as they played, you don´t need fancy gimmicks. I was really impressed when Stevie sang "Beautiful Child" and i want to thank the band "that they let me perform this very special song on stage", as Stevie mentioned, because this song has a very special meaning to me, too. And although it never has been a single or a classic live song i was touched in a way that i won´t forget. Same for "Goodbye Baby", the way they said goodbye in that slow tender way was the right mood to end this wonderful show. Thank you for such a special evening and as Mick siad at the end of the show: Take care of yourself and even more important take care for one another. Thank you for being the music companions of my life. And...well, if you heave heard "Stand Back", "Go your Own Way" and "Don´t Stop", you know that they can rock, yes THE MAC IS BACK! Dear Nicksfix! 13 years after the "Behind the mask"-tour stopped in Frankfurt (09/09/1990) one of my biggest dreams came true at the end of 2003! FLEETWOOD MAC came into town again!!! :- )))) Live & loud with a great show for eyes and ears - Lindsey, Stevie, Mick & John - how cool!!!! I never ever expected or was hoping to see FLEETWOOD MAC (especially Stevie of course!!) one more time LIVE on german floor. I don´t know how many times I´ve seen the DVD "The dance" (simply amazing!!) and prayed to be a part of this kind of show once in a lifetime - believe me! And now..after 13 years waiting...I was on cloud no. 9!! I cannot describe how happy I have been, how satisfied I felt standing right in front of Lindsey & Co. and listen to all the great music of FLEETWOOD MAC. A wonderful mixture between old and current stuff, a wonderful journey through past/ present/ future. The energy, the power and last but not least harmony between the band-members was breathtaking. You really had the feeling they enjoy what they do - and with whom they do it. There´s nothing bad in the air, if you know what I mean. Everybody knows there were problems in the past, but this was a concert with a lot of love, friendship and gratitude - especially between Lindsey & Stevie!! *yupee*:-))) It was so nice being a part of all this. We stood in the 1st row and I took some great pictures as you can see! Today I still cannot believe what I´ve seen and heard...and how happy I´ve been that night in Frankfurt. The greatest gift for me was "Silver springs" (the song has a great meaning for me) and "Stand back". That was a real great surprise Stevie singing Solo-stuff! Fundamental I have to say - Stevie was in best mood and wonderful to look at. She is unique and mysterious, her charisma is unreachable like her voice. When I think back to the concert 1990 she seemed very unhappy, very sad. I was so touched that I wrote her a letter after the gig to the States (which she answered by the way). But now there´s no need to write her words of comfort and worry:- ))) As well I need to mention that Lindsey was extremely "hot" (finally I can understand Stevie..hihi) and charming. This man is over 50!?? Unbelievable, because he moved like a 20-years- old guy on stage, his energy was never ending...his guitar-style..a thing between pleasure, passion and pain...simply amazing! And please - who is giving autographs after a concert when you are a celebrity like this!?? No one - besides Lindsey, Stevie & Mick. They took a few minutes to sign some stuff for fans from the 1st row....Anything else to say!? I wished I could see this show one more time!!! We thought about going to Nuernberg (Germany) a few days later, but unfortunately this gig was cancelled:-( So - better one great and unforgetable night with FLEETWOOD MAC than nothing;-)) And if you ask me - was it worth it..waiting patiently 13 years for a band!? I say YEEEEEEEEEEEEES with all my heart! Thanx to Stevie, Lindsey, Mick, John and all the great musicians in the back! YOU MADE MY DAY!!! :-)) MAC IS BACK!!!!!!!!!! All the best.